Kia’s new-for-2012 Rio has been a hit. Sales are up and overall the car is a big improvement over the previous generation in nearly every respect. 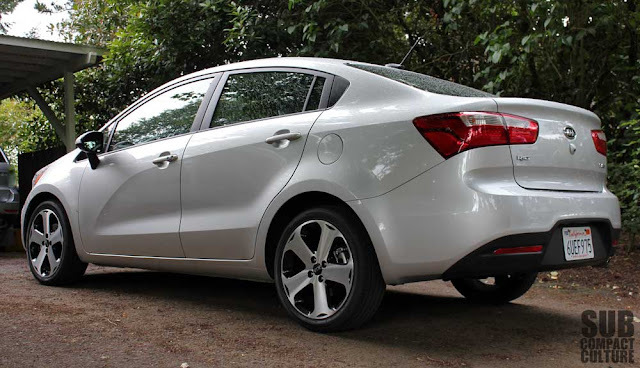 We reviewed the 2012 Rio EX hatchback in December. But we recently got a chance to spend a week with the just-released, top-of-the-line SX model, this time in sedan form. The SX trim level is available on both the hatchback and the sedan. It includes things such as 17” wheels and tires, a sport-tuned suspension, front LED accents, soft-touch dash materials, and Kia’s UVO infotainment system. We thought the ’12 EX hatchback was a bit on the conservative side in terms of styling. The SX does liven things up a bit with its larger, racier wheels, dual exhaust finisher, and LED accents on the front fascia. I also happen to prefer the Rio Sedan’s looks compared to the hatchback—a rarity for me—as I almost always prefer the hatchback version of a car if there is a sedan and hatchback version. In fact, I find the Rio SX sedan downright good looking. It almost has a bit of a Euro appeal to it. Our tester’s interior came equipped with optional heated leather seats, a power tilt/slide sunroof, and navigation. These only add to the already impressive list of standard features, which include power everything, a six-speed automatic (the only trans available unless you go to the entry-level LX trim package), proximity keyless entry, cruise control, Bluetooth, power folding mirrors, metal pedals, and an outstanding trip computer. The cabin is airy and feels sophisticated. Like most Kias, the Bluetooth and navigation are class-leading. Sound quality from the four speaker stereo with pillar-mounted tweeters is satisfactory, but not earth shattering. This little car has a big trunk. I’m not sure how many dead bodies you could get in there, but it’s got to be upwards of two. However, you can easily fit a lot of luggage in there—very impressive for a small car. Back seat room is also generous and comfortable. Equipment wise, this is like a miniature luxury car in many ways. However, the Rio isn't exactly the thing that champagne wishes and caviar dreams are made of. But for a subcompact car, this is pretty darn nice and very comfortable. No matter which trim level you opt for, there’s only one engine: The 1.6-liter DOHC gasoline-direct-injected four cylinder making 138 horsepower and 123 ft./lbs. of torque. The engine makes quite a bit of noise under full throttle; acceleration is adequate. It’s too bad you can’t get the SX (or EX for that matter) with a manual transmission, because that’d liven the driving experience up. The six-speed automatic is smooth shifting, and does have manual shifting capability. No complaints there. Although it’s no Cadillac, the Rio rides confidently and commendably. The SX, with its sport-tuned suspension, has an mix of grip and body roll. It feels like it sticks to the pavement well, but there is a lot of lean, which is exaggerated by the lack of side bolstering in the seats. Like the Rio EX, the SX has a driving experience that I’d consider comfortable and secure, rather than sporty and exciting. I got a not-that-impressive 28 MPG combined out of our EX hatchback model in December of 2011, but managed to get 31 combined with our SX sedan for whatever reason. That falls within the EPA’s estimated 30 city and 40 highway ratings. It should be noted that I was in Active Eco mode most of the time. This is a mode that can be used that changes throttle response to increase fuel economy. I like the Rio SX sedan quite a bit more than the Rio EX hatchback we previously reviewed, even though at their core, they’re the same vehicle (there’s a $2,200 price difference between the two). I think the sedan’s shape looks better (including the great 17” wheels), and I prefer the SX’s black leather interior, which makes the inside look more sophisticated. 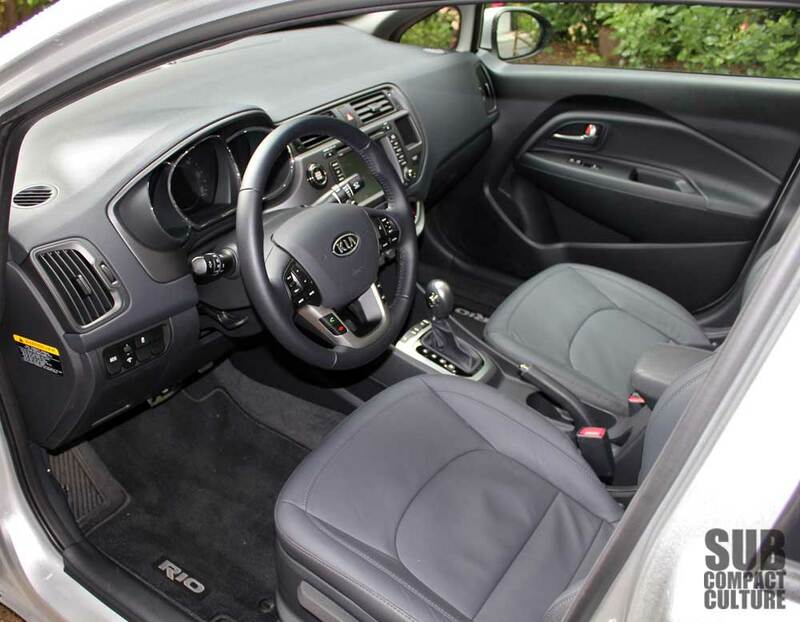 For me, the Rio’s biggest attribute is its interior, but there are a number of subcompact sedans out there offering very nice inside spaces, such as Chevrolet’s Sonic and Ford’s Fiesta. Our Rio SX tester stickered at $20,545 (including $750 destination), which is on par with a loaded Sonic (with the 1.4-liter turbo) or a decked-out Fiesta. The Rio does have the 5 year, 60,000 miles bumper-to-bumper warranty (better than Ford or Chevy) and 10 year, 100,000 miles powertrain warranty (longer than Ford, equal to Chevy). If you’re looking for one of the more comfortable subcompacts with a compliant ride and good looks, the Rio deserves a look. If you’re looking for straight-up sportiness, then might fall a bit short. 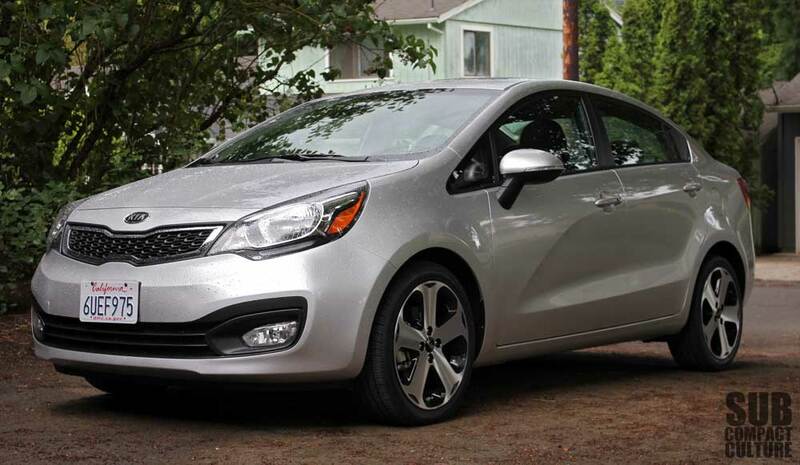 At the time of this writing, Kia had sold 22,396 Rios this year—an 88% increase over 2011. So I’d say there are plenty of people that are giving the Rio a shot. I'm hearing tons of complaints that the active eco only hurts MPG and I personally have found that to be true in my driving with my rio.